The PCOUNT G is a GATED 1 GHz/Channel photon counter that has the ability to collect photon counts only when the external gate input is positive. 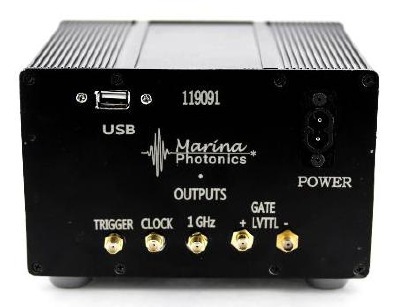 Photon events are collected into a total of 4,194,304 nanosecond bins for Time Correlated Photon Counting in the USB output version, or into unlimited bins with a Computer DIO version. The external input gate width can be as short as two nanoseconds, and the gate repetition rate can be above 200 Megahertz. For example, one can have a 6 ns gate width at 160 Megahertz repetition rate. The PCOUNT G can have one, two, or three channels of 1 GHz/second photon counting with one additional channel for the fiducial marking of gate edges. The gate intervals do NOT have to be the same width throughout a collection cycle. The gate width can be monitored in the ungated mode as well as the gated mode on the back of the device. Each and every gate interval can be individually examined for Time Correlated Photon events. The number of photons can be summed over any part of a gate or all of the gate times. The PCOUNT G can also collect photons in the ungated mode. The gate input level is 1.1V to 3.3V with an adjustable threshold. The PCOUNT G hardware begins accepting photons continuously and forever once triggered. The trigger can be provided by an external SMA input, a push-button, or switch latch after a manual reset to synchronize channels. Photon Counting begins under software control. 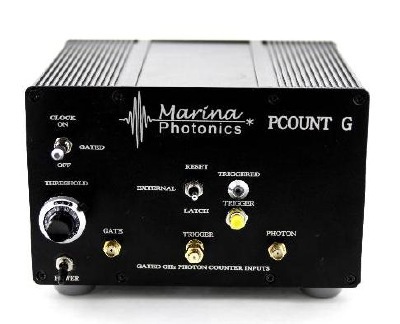 The PCOUNT G is designed for EDGE detection of photons from the PV16 amplifier discriminator with 150 picosecond minimum photon widths. The back of the PCOUNT G provides + and - input gate echos, gated GHz clock output, gated 125 MHz clock, and trigger indication. SIZE: PCOUNT G - 5.25" D x 4.0" H x 6.3.75" W exclusive of front panel connections, switches, and rear panel USB.